Lazy Seamstress: Another 40th Birthday means another new frock! It seems a few of my friends are turning 40 this year, and of course any excuse for a new dress. I'm still refining this self drafted princess seamed bodice, and am now I think finally happy with it. 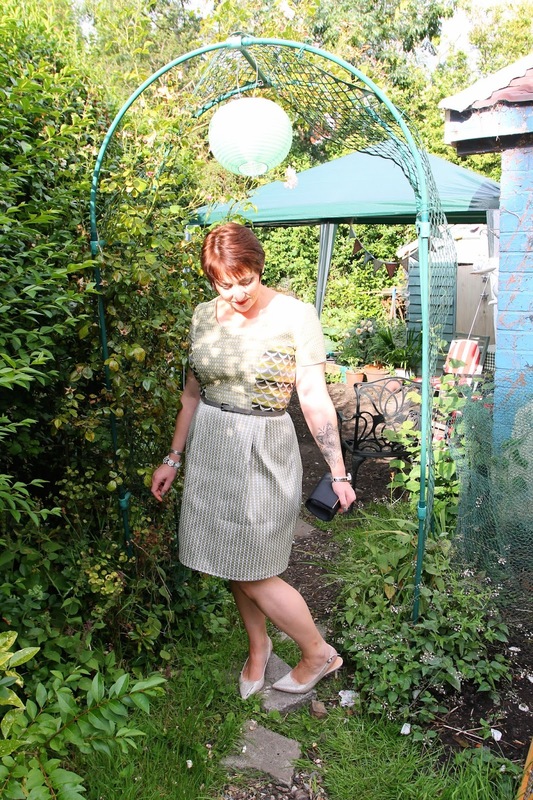 The fabric I've used for this dress was bought in three small remnants from a local soft furnishing fabric shop for 50p!! I do love the challenge of making a whole dress out of a few pieces of fabric. These pieces were fun to work with because the right and wrong sides of the fabrics are equally beautiful. Not being able to decide which sides I liked best combined with such small pieces to work with meant that I used all sides in a kind of (hopefully) successful way! One of the downsides though of working with remnants is there is never quite enough fabric for pattern matching. Luckily I can't see my own back! I felt great in this dress last night, like lots of us I worry about my figure, about my wrinkles, and saggy bits, but wearing a dress that fits and feels good goes a very long way to helping me ignore those voices in my head reminding me of all my faults. Another good reason to sew. Thank you, I did feel great. This is lovely, very flattering. Wow. You look amazing and what ingenuity!!! Wowser. Loving the current 1960s vibe. You are an inspirational dresser!